Features award-winning wines in a relaxed fun atmosphere. Built on footprint of Kerrville homestead overlooking Guadalupe River Valley. 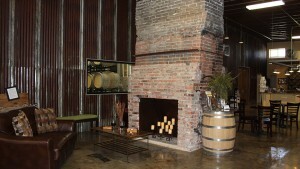 Tasting room features home’s original double-sided fireplace, 16-foot ceilings, window to winery activities, and unique rustic warehouse decor. Located 2.3 miles north of I-10 (exit 508) on Highway 16 north of Kerrville; 16 miles south of Fredericksburg. Tasting room, gift shop, tours, events.